Deer hunting is a waiting game. It takes great patience, and more, to fill your tag. There are no guarantees when deer hunting. Time spent afield can be cold, wet, windy, hot, sweaty, bug infested, and just plain miserable. You can spend hours and days looking at everything but deer. At some point, the moment of truth arrives. Hunting is defined as searching, seeking, or “in the process of finding what you are looking for”. It is not defined as killing, harvesting, or tagging a critter. Humans are all “Hunters and Gatherers”. We all hunt for food, good deals, new interests, mates, or any of the things we need in life. Hunters are also “predators”. Our eyes are set forward on our heads. This is so we can pursue and stalk our game. Canine teeth are for chewing and tearing the meat we harvest. Humans are also Omnivores, which means we eat plants and meat. That is our role and place in the ecosystem. How do you measure success? 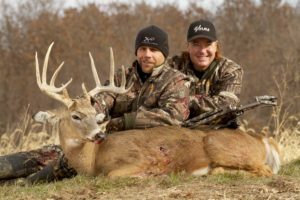 Many new hunters want the big antlers and a “fast food” hunting experience. Drive up to a hunting spot, sit for a little while, make a perfect shot, and start taking pictures. A real deer hunter knows a different truth. So, the “Moment” arrives and now what? This is when shooting skills take over. These marksmanship skills should be tuned after hours at the range. Seconds become minutes, your heart races, breathing increases, and it is damn exciting! The moment will never happen if you did not do any scouting. Placing your stand site or hunting in a promising area means hours afield looking for sign and critter locations. This may also mean gaining permission from landowners. If you are an archery hunter, this means practice from 10-40 yards. Repetition and muscle memory are important. 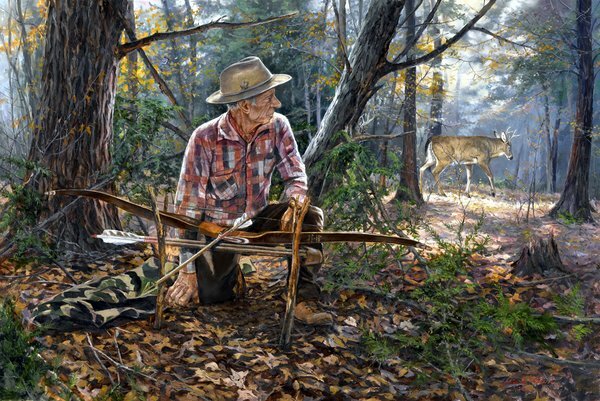 Old School recurve hunters often practices instinctive shooting. Hand and eye coordination align for accuracy, after hundreds of repetitions. Compound bow users must sight in their bows and practice the trigger pulls of a release. Smooth and accurate are again the result of a lot of practice. If you are a shotgun, black powder, or rifle hunter, you need to be familiar and safe with your weapon of choice. Each has its own advantages and disadvantages. Accuracy, range, firepower, and comfort become considerations. Today’s shotgun slugs can be accurate to 300 yards. A black powder in-line weapon can reach even further. With the proper rifle set up. 1000 yards is realistic. None of these shots just happen. All great shots are the result of many trigger pulls. Marksmanship is a perishable skill. The one thing that impacts great shots the most is eyesight. As we age, our eyes change. These means constant adjustment and accommodation. No ethical hunter should go afield without practicing their shooting skills. Accuracy is the result of breathing, trigger pull, muscle control, position, eyesight, optics, sighting in, repetition, and confidence. None of these skills can be purchased or picked up instantly. All require investments of time, money, practice, and education. With this investment comes confidence. Smart hunters do their homework. As kids, most Baby Boomers did not have You tube or videos to learn from. We had books or an Old Guy Mentor. Today’s hunters have a great arsenal of videos, online lessons, and shortcuts to becoming a good hunter. Map web sites and so many other resources are at the new, and old hunters’ fingertips. You get what you pay for when it comes to gear and weapons. Cheapo gear, knives, optics, footwear, and weapons are just that. If you plan to be comfortable, reliable, accurate, and consistent, get good gear. Sitting in a tree stand means a SAFE stand, weapon, and experience. A lot of bad things can quickly happen when you are 20 feet up in the air leaning against a tree. When the deer show up, it is usually in low light, odd weather conditions. The tree can sway, sighting is tough, and you need to remember where the parts are on your weapon. This is when good gear, practice, and experience pays off. Hunters are human! We learn from mistakes. Each time you miss, quit, give up, make a mistake, it is an opportunity to learn. Take ownership and responsibility for these mistakes. You are not a bad hunter for missing a deer. You are a bad hunter if you do not learn from it. When the moment arrives, it all becomes worth the money, time, and discomfort invested. The buck slowly moves into range. You are at full draw or have the crosshairs on target. Now, everything slows down. You must control the moment, breathing, and excitement. There will be plenty of time for excitement after. Pick the right moment to shoot. The range is within your practice zone, you have the right tool for the job. Breathing is a factor now. Take a full breath and release half of it. Now slowly pull the trigger or release the shaft. You will know immediately if you did everything right. You will never be a Great Hunter. Hunters are always learning, growing, changing and fine tuning their skills. We all only have so many hunting seasons in our lives. Age is not often our friend. Our bodies change and degrade. Every Moment is a blessing as we age. Just being afield is important. Mentoring young and new hunters is fun. Our lifetime as a hunter was just the excuse to search for happiness. Hunt hard and hunt harder!